A truley beautiful piece of jewelry that will stand out from the rest is our tungsten diamond hammer finish dog tag pendant with bead chain. Made from black carbide tungsten with a hammered finish and featuring a 0.01 total carat weight round brilliant diamond with clarity S 11 and color G/H. The dog tag measures 1 and 3/4 inch by 1 inch and hangs from a 3 millimeter beaded chain. The tungsten diamond hammer finish dog tag pendant with bead chain is scratch resistant which makes it the perfect metal for the dog tag pendant. Tungsten is 100% hyopallergenic so there will never be an allergic reaction to worry about. 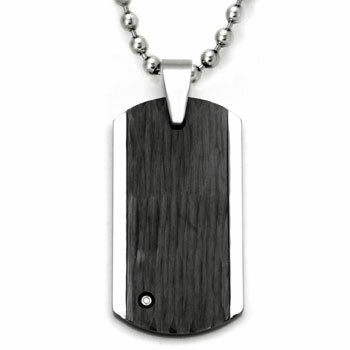 The tungsten hammer finish dog tag is a great gift for any special occasion. Whether a graduation gift, birthday present, promotion, or new job. This pendant comes with a free 3MM military style bead chain.